Gildan, a wholesale apparel manufacturer, is making strides toward becoming a retail clothier in its own right. The brand, which broke into the retail market in 2011, went up against Hanes and Fruit of the Loom in the men's underwear space and is preparing to take on Victoria's Secret and Maidenform in the women's category. The company is trying to shake up apparel markets that haven't had a lot of new competition by building its products and campaigns around millennials. Its apparel lines, including t-shirts, underwear, hoodies and activewear, are designed to fit consumers aged 22 to 35. Its marketing is geared toward that same cohort. "The fun had been taken out of the business," said Rob Packard, VP-marketing and merchandising at Gildan. "We are trying to put some of the memorability back in." 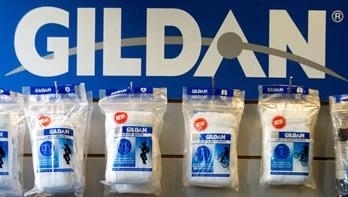 Gildan may be new to the retail space, but many customers are already familiar with the brand because of its wholesale business. Gildan t-shirts have lingered inside consumers' dressers for years, masquerading as concert and sports memorabilia. The brand aims to tap into the memories people associate with its products, even if they don't realize it. "We're trying to tell stories about fun moments in your life," said Mr. Packard. In 2013, Gildan took that message to advertising's biggest stage with an ad during the Super Bowl. It was an existing spot that featured a young man trying to get his t-shirt back from a one-night stand before sneaking out. "We said "let's go with one big push right out of the gate as our introduction,'" said Mr. Packard. "We got indoctrinated by fire. We went from nice steady, fast growth to hurdling on the roller coaster ride." The clothier launched its men's underwear line that same year. It jumped from almost zero market share in the U.S. category to 7%, trailing the space's long-time frontrunners Hanes and Fruit of the Loom, said Mr. Packard. "The competition was complacent," he said. "They were not prepared for a [shake up] in an industry that the two of them absolutely dominated." The category itself has also grown. In the U.S., the men's underwear bottoms market reached $2.7 billion in sales and grew 2% in the 12 months ending March 2015, according to market tracker NPD Group. Like the Super Bowl spot, Gildan's other TV and digital ads show the great lengths people will go to for their clothes. In one, a man races past an old woman and an injured dog while rescuing his hoodie from a burning house. The company also partners with ESPN to reach college sports fans by sponsoring a college football bowl game in New Mexico each year and NCAA basketball games. And it linked up with the online gaming site Twitch, Lifetime Fitness and the Esprit de She Race Series to connect with a wider audience. Last month, Gildan tapped Blake Shelton, whose popularity as a country music star and a judge on NBC's "The Voice" earned him notoriety among both men and women across the country, to star in two spots promoting the brand's socks. Next up for the brand -- women's underwear. The clothier is boosting its presence where women shop online, tapping fashion and mommy bloggers to spread the word and running a spot aimed at women. It's also planning to raise awareness of its sustainability efforts to attract the segment of the market that cares about where their clothes come from. Its aspirations in the fragmented women's market are lofty, because private-label specialty retailers like Victoria's Secret sit largely untouched at the top. But the category represents $3.4 billion in annual sales, according to NPD Group. The same 7% market share that Gildan garners in men's underwear would be worth 25% more if achieved in the women's space. "The goal is always to make a high-enough quality product," said Mr. Packard, adding that Gildan aims to show consumers they can get the same quality at a better price. "We're not there yet. We know it's an evolution."